The Gallery opened in 2009 to showcase the diverse artwork created by the many talented artists and crafts people on the Island. 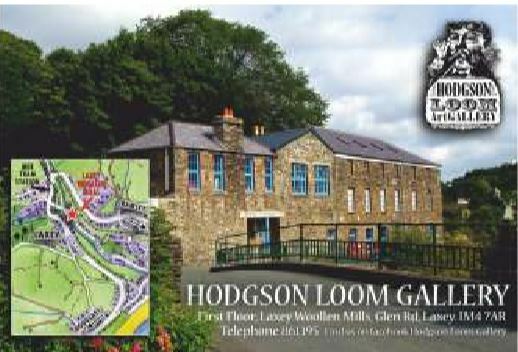 The owners of Laxey Woollen Mills refurbished the first floor Loomery to create the gallery space and named it after the rare 1918 Hodgson Loom which still graces the space. Philanthropist, artist, critic and mainstay of the Arts and Crafts revival, John Ruskin, was instrumental in the setting up of the Mill in 1881 – it is fitting that the space now houses a gallery. ​Creative Network artists showing in the gallery during the festival include: Val Galpin; Eve Adams; Erica Kermode; Pat Tutt; Neil Milsom; Alison Winkle; Shane Lucas; Greg Barlow; Maureen Kennaugh; Sarah Devereau; Graham Rider; Di Beckerson; Rebecca Odessa; Ronnie Doyle, Julia Ashby Smythe, Frauke Watson and Rosie Wood.